A surgical procedure for tracheal stenosis in which the damaged, narrowed segment of the trachea is removed and the healthy remaining trachea is sutured back together. 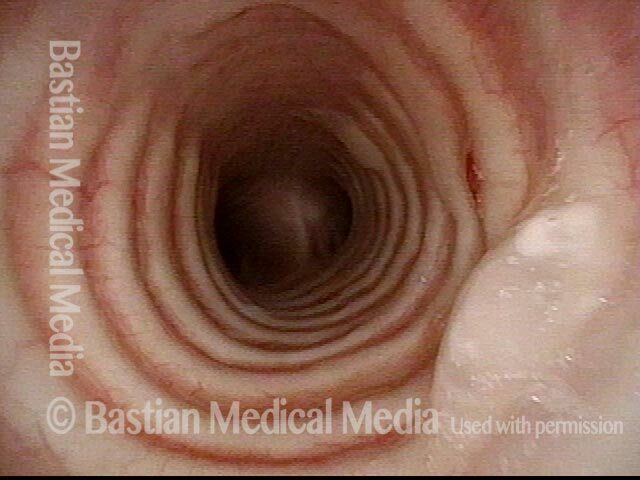 This view from the level of the vocal cords shows high-grade tracheal stenosis, involving rings two, three, and four; the airway here is an estimated 30% of its normal diameter. For reference, a dotted line marks the level of the cricoid cartilage. Slightly closer view. This patient is very short of breath with minimal activity and, even at rest, has audible stridor. Elsewhere, across a span of several prior weeks, she had undergone three dilation procedures with only minimal, transient benefit. 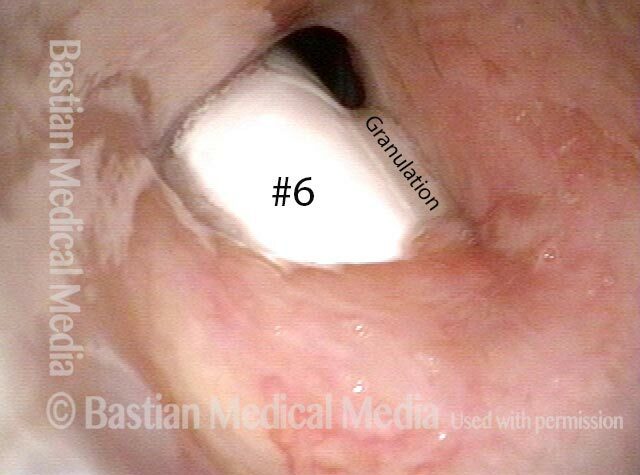 Close-up view shows scarring, collapse of tracheal walls, and some granulation tissue. The trachea just beyond the stenosis is normal. Five days after tracheal resection and primary reanastomosis. Compare with photo 1. 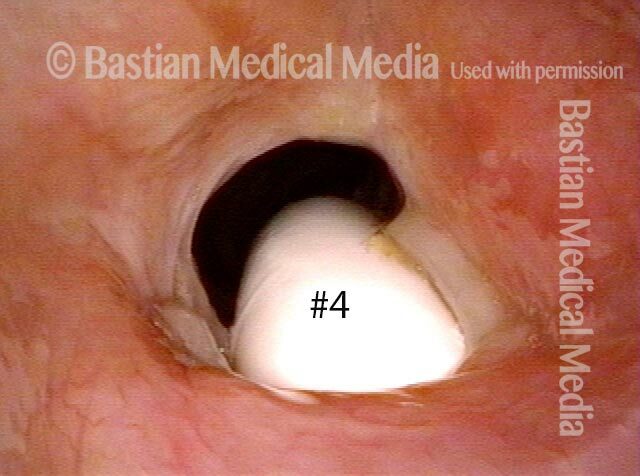 Note that the airway’s diameter has at least tripled (part of the opening is obscured by tenacious mucus). The patient’s shortness of breath is now gone, as is the stridor. Close-up of the line of anastomosis, with a couple of sutures visible. Compare with photo 3. Again, tenacious mucus in the upper part of the photo is obscuring part of the view. Another eight weeks later. The airway is wide-open and has also now healed since the surgery. Compare this view with photo 1 (pre-surgery) and photo 5 (early follow-up). Compare this view with photo 2. View from above the level of the vocal cords, showing severe narrowing and deformity of the upper trachea, caused by a “difficult” tracheotomy many years earlier. This man is frustrated by activity limitations, and difficulty coughing up accumulated mucus. 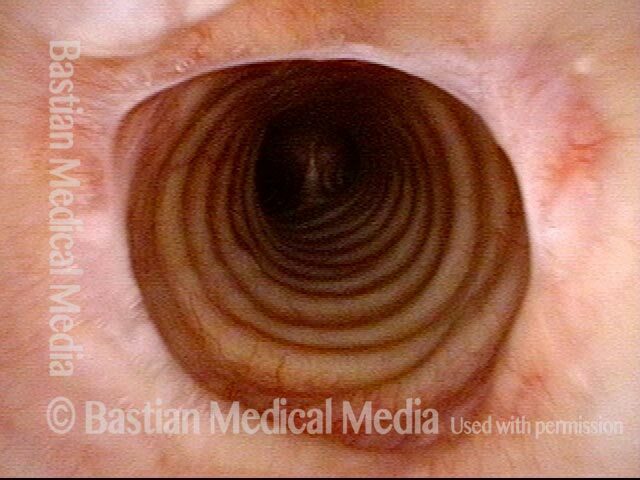 View from just below the level of the vocal cords, showing the deformity and stenosis more clearly. The trachea below the area of stenosis is normal. 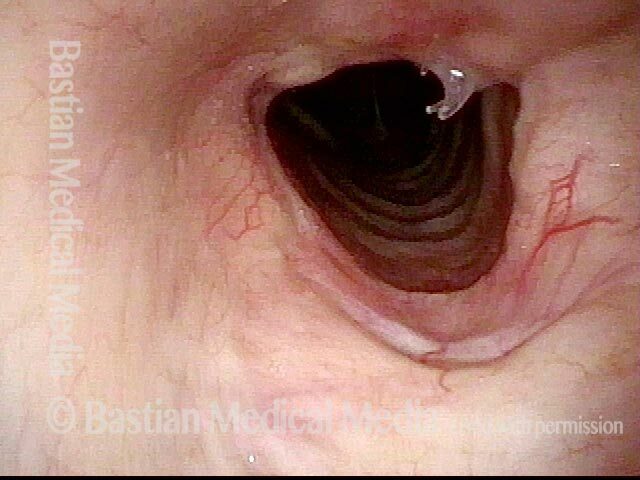 View from just above the level of the vocal cords, six weeks after tracheal resection and primary anastomosis, showing final result. Patient feels he breathes completely normally. Compare with photo 1. View from just below the level of the vocal cords. The tracheal caliber is now virtually normal. A broken, absorbable suture is seen at 2 o’clock, and a tiny remaining unhealed area is at 11 o'clock. Compare with photo 2. 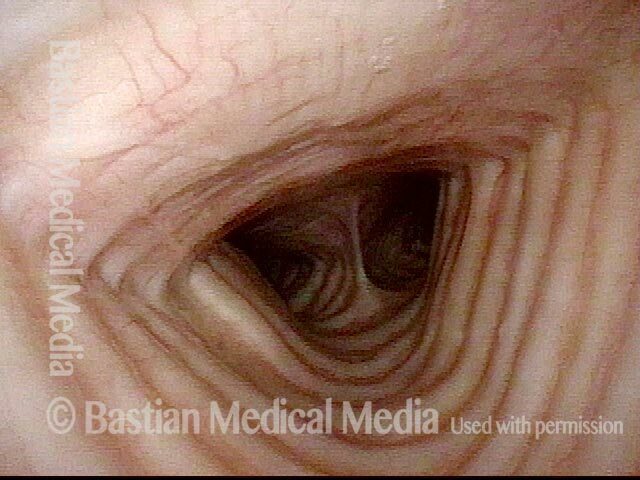 A close-up view shows the circular line of the anastomosis more clearly. Due to a life-threatening illness, this person had an endotracheal tube in place for a few weeks. When she got stronger, a tracheotomy tube (not seen as it is below this level of the trachea) was inserted. The result is severe scarring in the trachea. The expected diameter of the tracheal opening is indicated by the dotted line. The “X” marks the same location in each of the two photos. When this person exhales fully through her tracheotomy tube, or if she attempts to speak, the membranous tracheal wall also bulges forward, and obliterates the tiny residual opening. Dilation has been performed but helped minimally. The indicated procedure, if her severe medical condition will allow, is removal of the damaged segment of the trachea with reconstruction (aka tracheal resection, primary reanastomosis). This woman was gravely ill and intubated longterm. A tracheotomy was required. Now she wants the tube removed. The tip of the scope has been taken below the vocal cords. Note the fenestrated tracheotomy tube within the high trachea. When the patient plugs her trach tube with a finger, air comes into the distal tip of the tube (dark circle within the tube), passes up and out of the fenestra (window) and can power the vocal cords which are above our view. 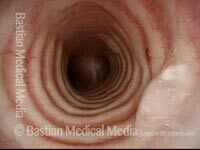 The trachea surrounds the tube as a whole without any "blow-by". If there were no fenestra, the patient would be unable to speak. After tracheal resection and re-anastomosis, the tracheotomy is no longer needed. The circular scar is at the dotted line. The M denotes overlying mucus. The patient now breathes normally. 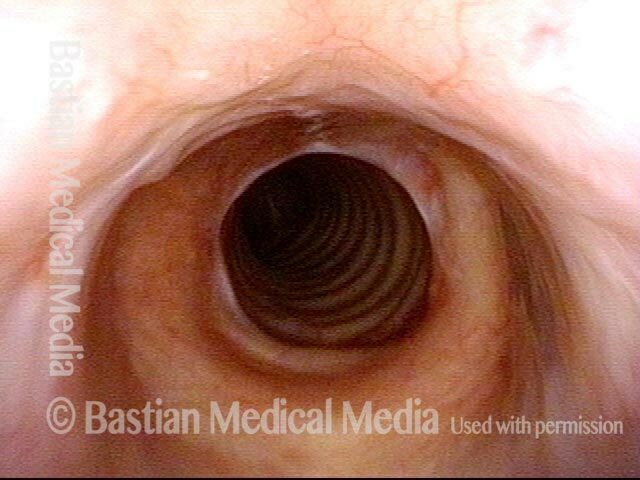 Wide-angle view of vocal cords and subglottis, with white tracheotomy tube in evidence. This person was sent for resection of a stenotic (scarred, narrowed) tracheal segment, and repair. The patient can barely breathe when her trach tube is plugged for one or two breaths as a test. 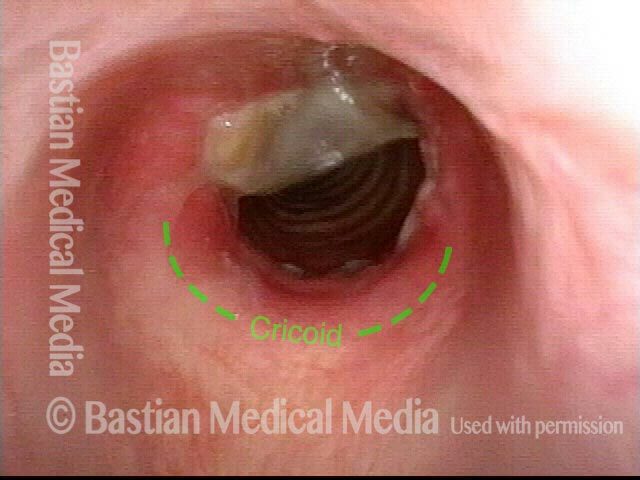 In this distant view, we can't evaluate the trachea, but do see posterior vocal cord tissue loss caused by a prior endotracheal tube injury (area enclosed by dotted lines). Sometimes, as depicted here, the tube itself obstructs a stenotic segment that, without the tube, might be large enough that tracheal resection/ reanastomosis is not needed. The #6 tube in photo 2 has been replaced here with a #4 (smaller) tube. The posterior thrust of the curvature of the smaller tube is less; furthermore, the diameter is smaller. For both reasons, there is much more space for "blow-by" and the patient can breathe quite well with the tube plugged. If she can tolerate it plugged 24/7 except for routine cleaning, the tube can be removed, giving even more space for passage of air. This careful process may remove the need for surgical repair. This entry was posted in Multimedia Encyclopedia and tagged Airway disorders, Photos, Treatment by admin. Bookmark the permalink.